The ‘Pearl of the Adriatic’, situated on the Dalmatian coast, became an important Mediterranean sea power from the 13th century onwards. Although severely damaged by an earthquake in 1667, Dubrovnik managed to preserve its beautiful Gothic, Renaissance and Baroque churches, monasteries, palaces and fountains. Damaged again in the 1990s by armed conflict, it is now the focus of a major restoration programme co-ordinated by UNESCO. The ‘Pearl of the Adriatic’, on the Dalmatian coast, was an important Mediterranean sea power from the 13th century onwards. Although severely damaged by an earthquake in 1667, Dubrovnik managed to preserve its beautiful Gothic, Renaissance and Baroque churches, monasteries, palaces and fountains. Dubrovnik was founded in the first half of the 7th century by a group of refugees from Epidaurum, who established their settlement at the island and named it Laus. The Latin name Ragusa (Rausa), in use until the 15th century, originated from the rock (Lat. lausa = rock). Opposite that location, at the foot of Srđ Mountain, the Slavs developed their own settlement under the name of Dubrovnik, derived from the Croatian word dubrava, which means oak woods. When the channel that separated these two settlements was filled in the 12th century they were united. From the time of its establishment the town was under the protection of the Byzantine Empire; after the Fourth Crusade the city came under the sovereignty of Venice (1205-1358), and by the Treaty of Zadar in 1358 it became part of the Hungarian-Croatian Kingdom, when it was effectively a republican free state that reached its peak in the 15th and 16th centuries. An economic crisis in Mediterranean shipping and, more particularly, a catastrophic earthquake on April 1667 that levelled most of the public buildings, destroyed the well-being of the Republic. This powerful earthquake came as a turning point in the city’s development. 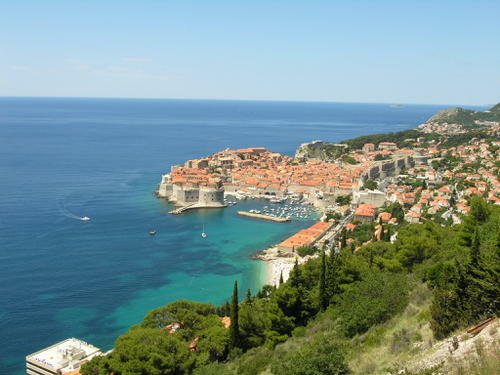 Dubrovnik is a remarkably well-preserved example of a late-medieval walled city, with a regular street layout. Among the outstanding medieval, Renaissance and Baroque monuments within the magnificent fortifications and the monumental gates to the city are the Town Hall (now the Rector’s Palace), dating from the 11th century; the Franciscan Monastery (completed in the 14th century, but now largely Baroque in appearance) with its imposing church; the extensive Dominican Monastery; the cathedral (rebuilt after the 1667 earthquake); the customs house (Sponza), the eclectic appearance of which reveals the fact that it is the work of several hands over many years; and a number of other Baroque churches, such as that of St Blaise (patron saint of the city). The original World Heritage site consisted solely of the defences and the intra-mural city. It was later extended to include the Pile medieval industrial suburb, a planned development of the 15th century, and the Lovrijenac Fortress, located on a cliff, which was probably begun as early as the 11th century, but owes its present appearance to the 15th and 16th centuries. Also included were the Lazarets, built in the early 17th century to house potential plague-carriers from abroad, the late 15th-century Kase moles, built to protect the port against south-easterly gales, and the Revelin Fortress, dating from 1449, which was built to command the town moat on its northern side. The island of Lokrum lies to the south-east of Dubrovnik, some 500 m from the coast. In 1023 it became a Benedictine abbey, the first of several in the Republic of Dubrovnik. It was continually enlarged in succeeding centuries, passing to the Congregation of St Justina of Padua in the late 15th century, when a new monastery was built in Gothic-Renaissance style to the south of the ruins of the Benedictine establishment. During their occupation of the island in the early 19th century the French began work on the construction of the Fort Royal Fortress, which was completed by the Austrians in the 1830s. In 1859 Archduke Maximilian of Austria (later Emperor of Mexico) bought the island with the intention of building a villa in classical style on the ruins of the Benedictine abbey, but only a small part of this work was completed.